Editor’s note: This week’s column was originally presented September 2, 2011. It’s here again this week because this beautiful museum is now fighting for its life, thanks to the bankruptcy of its landlord, Inner City Broadcasting. The California Historical Radio Society needs to raise $750,000 within the next week or so to make a last-ditch bid to buy this building before it heads to auction – and very possibly to a new owner who won’t let CHRS stay here. One of our favorite radio towns is, alas, one we don’t get to as often as we’d like – San Francisco and the Bay Area. So when a family event drew us westward in January 2010, we jumped at the chance to add a couple of days to the agenda to do some catching up on sites (and radio friends) we’d been meaning to visit. Right at the top of the list was a site we’d driven by many times, but had never been inside: the site along I-80 at Ashby Avenue in Berkeley, along the shore of San Francisco Bay, that’s home to the transmitters of KEAR (610 San Francisco) and KVTO (1400 Berkeley). When we used to drive past this site in the late 1980s and into the 1990s, it was a mess: long vacant except for the AM transmitters, the building had fallen into disrepair, covered in graffiti and boarded-up windows. 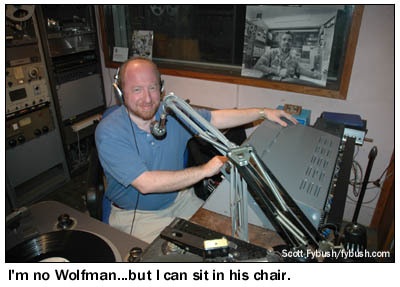 It looked like a sad (and all too typical end) for a place that was once full of radio history. And what a history it was! 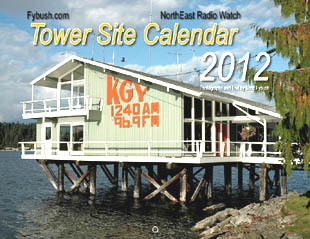 This site sprang to life in 1937 as the transmitter building for Berkeley’s hometown AM station, KRE, then at 1370 on the dial. It was pretty modest then: just a small block building (still extant as the center part of the structure) in front of a 178-foot self-supporting tower. But KRE (moved to 1400 in the 1941 NARBA shift) grew quickly out here, adding a one-story studio building in front and then, by 1950, going full-on Art Deco with a second story that included office space and an expanded first story that included more studio space for the AM and its new sister FM at 102.9. The old tower came down in a storm in 1957, and KRE didn’t fully regain its old signal strength until 1965, when the current 449-foot guyed tower out back went up. 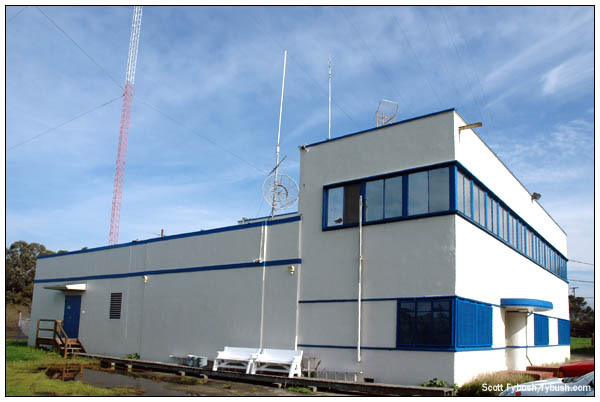 The stick added a second AM tenant in 1968, when the mighty KFRC (610) moved its transmitter across the bay from a different diplexed site, the KSFO (560) site at Islais Creek south of downtown San Francisco. That was a very tight diplex and never worked all that well, from what we’ve been told; from the East Bay, KRE’s tall tower provided a nice quarter-wave-plus launching point for KFRC’s non-directional fulltime 5000 watts, setting the stage for several decades of ratings dominance at 610 on the dial. Callsigns changed over the years – at 1400, KRE became KPAT, then went back to KRE before devolving into an FM simulcast (KBLX), business talk (KBFN), back to the FM simulcast (KBLX) and finally to its present-day existence as KVTO (“Voice of The Orient”) with Chinese-language programming. Somewhere along the way in the 1980s, KRE/KBLX-FM moved its studios out of the transmitter building, leaving behind signage (a painted “1400 AM – K R E – 102.9 FM” above the second floor and a backlit “KBLX” sign on the side wall) and not much else. So was KRE’s old building destined to the fate of so many magnificent old broadcast plants, left to rot into the swamp until finally being replaced by an efficient but soulless enclosure for a couple of small solid-state AM transmitters? Walk in the front door (the building is open to visitors most Saturdays and by appointment at other times; we were privileged to have a private tour on a Friday afternoon) and you know immediately you’re in a special place: the front lobby features a selection of antique radios and early TVs and historic photos of the station and the building. 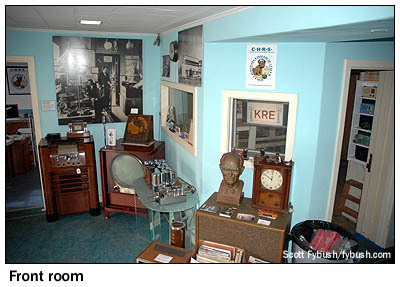 To the left, a former office houses a small gift shop and a restored vintage console from which broadcasts might one day be originated again. KRE’s old studios were in a cluster of rooms behind this one on the west side of the building, and most of them have been turned into display areas for the gems of the CHRS collection, roughly in chronological order. 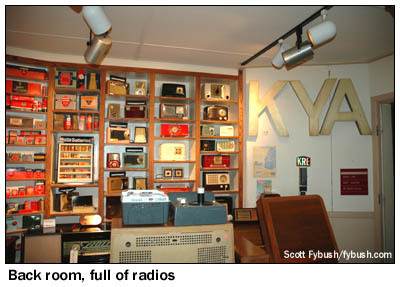 A front room (of which just a tiny portion is shown above) contains the very oldest radios dating back to the early 1920s. 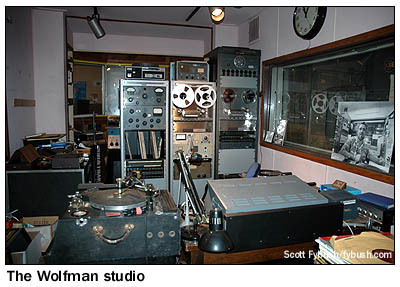 A smaller studio next to it is full of tubes, and a bigger studio behind that is chock-full of radios, phonographs, tape players and other goodies from the transistor era and beyond. To the right of the front desk is a room devoted to vintage TV sets and memorabilia – and that’s just the first floor. Up the Deco staircase, the second floor is a little more utilitarian but no less amazing. 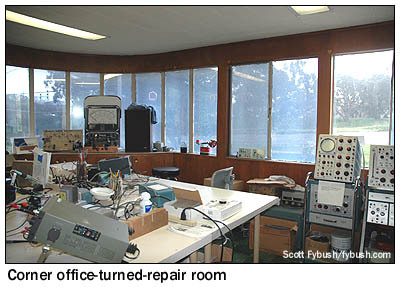 The old general manager’s office at the top of the stairs has become the repair and restoration facility for CHRS, which raises much of its budget by accepting vintage radios as donations and then having its volunteers restore them for sale. 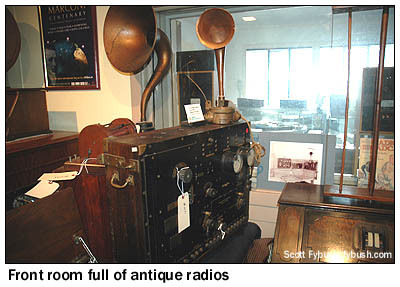 A conference room at the other end of the hall has become the display area for all the radios for sale (CHRS holds occasional outdoor sales and auctions, too) – and the back of the second floor is home to a massive library and an amateur station, W6CF. And we hope there will be a next time: in just in the year and a half since this visit, CHRS has been busy with even more work at the site, restoring the lightning-bolt designs around the porthole window in the front door and moving the Bay Area Radio Museum and Bay Area Radio Hall of Fame into this building as well. Want to see more? (Of course you do!) Take a video tour of the building right here…and then, if you’re able, go here to make a contribution to help save the museum and keep all that hard work from going to naught! Thanks to CHRS president Steve Kushman and Art Lebermann for the tour!